1) Grill the red peppers until the skins are blackened. If you have a gas stove you can char the skins over one of the rings. Set aside then peel and core when they are cool enough to handle. 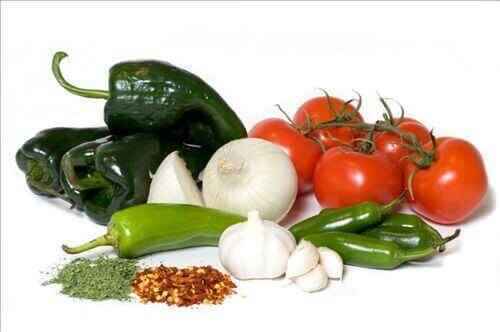 2) Meanwhile place the chilli, garlic and tomatoes in a roasting dish and roast in a hot oven until the garlic is soft. You can remove the skins from the tomatoes and de-seed the chilli at this point if you wish. 3) Place all the vegetables in a blender or food processor – alternatively strain through a sieve. 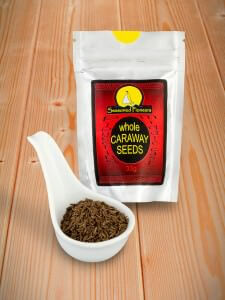 4) Gently heat the caraway seeds and oil in a frying pan until fragrant. Then add to the vegetables and whizz to a paste. 5) Chill before serving. Serve in a bowl with quarters of hard boiled eggs, chunks of tuna fish or black olives.